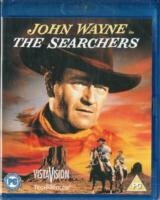 Thought by many to be director John Ford's masterpiece, 'The Searchers' tells the story of Ethan Edwards (John Wayne), an ex-confederate soldier who swears revenge after his brother's family is butchered by Comanches and his niece (Natalie Wood) is kidnapped. Accompanied by Martin Pawley (Jeffrey Hunter), a young foundling raised by the family, Ethan sets out on a epic seven-year search for the missing girl. But as their quest draws to a close, Martin begins to realise the extent to which Ethan has been dehumanised by his own thirst for revenge.